Diverse moveset and Azerite Spike is one of the stronger hitting no setup elemental abilities. Too slow to really use Counterspell but Forboding Curse is still a decent turn anyways. As I eyed my purchase of the Azerite Puddle I was more than a tad disappointed. Could have had azerite Sparks coming from it, but it doesn't. 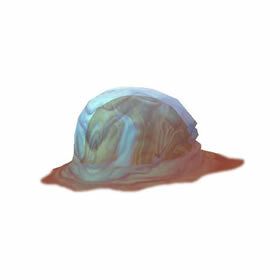 In battle, however, this puddle of goo shines like a diamond. Very effective, very. I leveled him to 24 (so far), and he's become one of my front line battlers. My go-to puddle of goo. Open with counterspell. Blast the enemy team with Psionic Shockwave. Then back to Counterspell since it's on a 2 round CD. Lather, rinse, repeat as needed. Azerite Puddle is a very powerful Magic pet. I took advantage of Pet Week to level it and my other new pets. The part that surprised me was that the Puddle at (if I recall) level 12 did substantial damage to the level 25 boss pets in Pandaria. I think it will find a place in several teams now that I have it at 25. Not sure this is worth it for 200 Charms considering I still had to use a Blue Stone on it after purchase, but it does look pretty cool and is super adaptable to a variety of pet battles. These drops of Azerite are volatile and prone to explosive reactions when prodded.